Get the Govt job offer from MNFSR Ministry of National Food Security and Research Jobs 2019 PTS Form Download. 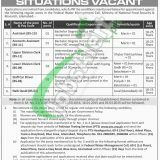 Applications are currently advertised in the Jang newspaper from Federal Govt body named Ministry of National Food Security & Research Livestock and Dairy Development Board, Islamabad is hiring the well disciplined, expert and educated applicants are required to apply for "Federal Water Management Cell Ministry of National Food Security and Research, Islamabad". The following vacancies which are entitled as (Assistant (BS-15), Accounts Assistant (BS-11), UDC (BS-11), LDC (BS-09), Staff Car Driver (BS-04), Naib Qasid (BS-01)) are the posts which need to be filled by the applicants having Bachelors/FA/FSc/I.Com/Matric/Middle/Primary in relevant field with relevant experience as per the demand of vacant positions. After final selection, the selected candidates shall be appointed on contract basis for a single year which will be extended further till the completion of the project or remain continuously on the basis of performance. So, these all are the details to be read and one can apply before due date. Let’s have a look at it’s applying method below. MNFRS is the abbreviation for Ministry of National Food Security & Research is the Federal Govt body working under the Govt of Pakistan and is having multiple tasks such as policy formulation, economic coordination and planning in respect of food, grain and agriculture. Being a Govt body it offers Govt jobs. For Sr. No. 1 to 4 Application forms shall be downloaded from the official site of PTS or through web link given below. Applicants need to submit the applications for Sr. No. 1 to 4 to PTS Headquarter Islamabad. For Sr. No. 5 & 6 all applications need to reach the Federal Water Management Cell, 69-E 1st Floor Adeel Plaza, Fazal-e-Haq Road, Blue Area Islamabad. Address for Sr. No. 1 to 4: PTS Head Office 3rd Floor Adeel Plaza Fazal-e-Haq Road Blue Area Islamabad. Address for Sr. No. 5 & 6: Federal Water Management Cell, 69-E 1st Floor Adeel Plaza, Fazal-e-Haq Road, Blue Area Islamabad.